A curious kitten which appears to have a love of the sound of a purring engine, managed to travel 15 miles in one vehicle and then had to be freed from another. The kitten, named Diesel by RSPCA staff, is believed to have begun his adventure when he stowed away in the engine of a car on Monday, 3 October which was visiting the Lace Market area of Nottingham. The driver thought she heard the sound of a meowing cat, but believing it was somewhere nearby, she began her journey back to Station Road, Southwell, 15 miles away. The next morning the driver again heard the sound of a kitten, and called on her husband to find him. They discovered Diesel hiding in the engine bay of the car, but when they tried to rescue him he ran straight under their other car. The couple then tried to remove him from the second car, only to find to their horror that he had dashed across a busy main road and straight into the engine bay of another parked car. Once again they tried to coax the cat out of the car, but it appears he was having none of it! After a few hours of perseverance by local residents and the RSPCA, the fire and rescue service was called. A crew from Southwell attended and with the help of a local mechanic they managed to jack the car up in a bid to rescue Diesel. "The kitten was terrified to come out of the car and remained there for several hours. But we couldn’t just leave him as it was dangerous. It took more than two and a half hours to rescue the kitten. He was removed completely unharmed although very dirty. 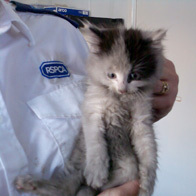 He has been taken to the RSPCA Radcliffe Animal Shelter. We hope that his owner comes forward to reclaim him, if not we will look to rehome him. I would just like to thank everyone who helped out in the rescue of this kitten, and we are relieved that he is safe and well following his ordeal. He clearly has a thing for cars." Awww, what a super cutie! That's amazing. I couldn't believe he wasn't even injured. Well, based on his attachment to engines, I'd hazard a guess that his owner was a mechanic. heheh..